Recent release “The Vacancy Hunter,” from Page Publishing author Carter Burdette, is a riveting account of the court proceedings embarked upon by a petroleum tycoon and his renowned attorney as they champion for what is right and deserved. 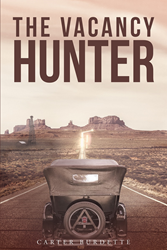 Carter Burdette, a retired lawyer and prominent figure in Fort Worth, Texas, has completed his new book “The Vacancy Hunter”: an exciting and realistic courtroom drama in which a wealthy oil man must engage the assistance of a reputable attorney in order to fight for what is rightfully his. Published by New York City-based Page Publishing, Carter Burette’s pragmatic yet engaging tale follows war veteran and petroleum tycoon Buck Giles as he defends his claim to a small but lucrative portion of the Yates oil field. Having grown up on a farm where he knew poverty, he decides to hire a very prominent attorney to help him in his fight. In spite of the draining nature of the court system, Buck refuses to give into his opponents, proving that staying strong and sparing no expense in the name of truth and ownership will yield great success in the end. His story takes place in the boom-time of the Texas oil industry. Land disputes often led to court cases like the one fictionalized in this novel. The just resolutions of such cases assured that the backbone of that economy was built on honest ownership, which is part of why Texas oil fields continue to provide Americans with this valuable resource today. Readers who wish to experience this thorough work can purchase“The Vacancy Hunter” at bookstores everywhere, or online at the Apple iTunes store, Amazon, Google Play or Barnes and Noble.